American actor best known for playing Kirk in Star Trek and Star Trek: Into Darkness. He has also appeared in Unstoppable, Hell or High Water, This Means War and Jack Ryan: Shadow Recruit. In Entertainment Weekly he remarked on his height and weight, saying: "I'm six-foot, I weigh about a buck sixty-five" and also on SNL sang "I'm 6 Feet Tall and Chris Evans....Chris Evans is 6 Feet as well." I just reckoned that Pine would measure that height after a day full of physical activity or strain on his spine. Of course he wouldn't measure that for the majority of a day or for the most part. 6'0.25"? There is no way if he is this low. Pine edge out Jeff Bridges whose listed 6'0.5" but look more like 6'0.25" than Pine. 6'0.5" listing is fine while he can look 6'0.75". 6ft 0.25 might be the low end of a range I'd try to argue for him. They are not that bad for actors. Imagine - for an A-lister - earning £250,000 for a couple of days just talking and interacting with fans - people who are willing to pay daft money for autographs or photo ops. Rob, But thinking about Jason Momoa was a rare kind of a A-Lister famous than Pine and willing to show his face occassionally on comic con so that doesn't make Pine any special for that "A-list titled" its like up to himself if he wanted to show up to his fans and get more interaction to show some friendliness to his supporters. I still think Chris Pine downplay some height to get more "A" lead roles chance in hollywood. I wouldn't hesitate not to give a 185cm as he can pull off 6'1 in some of his work. Momoa was used to events from doing them over 10 years ago, he seems to like the atmosphere and the fan worship. I'd hope one day Pine might do some. He's a very honest 6 footer who may be rounding down a fraction. He says he's 6-0 and looks it. The average guess is good. I'm not surprise if Rob happen to met Pine at a comic con and took a picture with him and most likely will upgraded him to 6'0.75". It's all positivity too - very few people are coming up saying negative stuff to actors at events, it's all gushing and hero-worshipping. I think he is 183.6 cm tall. More i look at Pine and Quinto i felt that Quinto were not visibly taller than Pine except for a better posture. Pine sometimes could edge out both Karl Urban and Quinto easily. Lol, that makes no sense dude. I'm 5'11.5 and wear orthotics, so I'm around 6' and have never been guessed at 6'2, let alone 6'3. More 6'-6'1. People who are commenting that need to get their eyes checked. @CDS, To be fair, if you are a legit six footer, you will constantly be guessed as being 6’ 2”-6’ 3.” That’s just the way it is. Chris Pine could just be 6’ flat, but in his day to day life I am certain everyone thinks he is taller than that. Everyone who is 5’ 10” says they’re 6’ tall so it makes 6’ seem average while in reality 6’ is about 3 inches above the average height of an American adult male. If he himself is claiming 6', I can't imagine he's over that? I did really think he was taller since he edged out Kevin Costner in the jack Ryan flick a few yrs ago. Maybe I was looking at the angle wrong, since I can't imagine Kevin being no more than 6' flat? Pine was suspiciously taller than Gal Gadot at SDCC 2018. He was wearing flats... or rather what looked like flats, while she was in heels yet the usual distance between them remained as if he was wearing dress shoes. I figure high chances that Pine might measure 6'0 5/8 (184.5) and Quinto right at 6'0 3/4 listing. Karl Urban is more like 6'0 3/8 (183.8). 3-5mm shorter than Quinto might be little chances. But truth is they literally look the same height not 1/4 standing side by side. Are you kidding me? If anything majority of people here have been trying to upgrade Chris Pine (to a full 6'1), which IMO is ridiculous. Like others have said, he simply looks 6ft and nothing more. @Kevin If he is only 6'0 then Zachary Quinto is not even safe for a 6'0 1/8. He's 6'0 just like he said...no more or less. A legit 6'0 is taller than people think. In the movie Stretch, Chris Pine is standing face to face with Patrick Wilson who is listed at 6'1". Chris Pine is supposedly 6' and a half-inch. However, Chris Pine is at least several inches shorter Wilson as they face each other. In fact, Wilson dwarfs Pine! I don't understand why people are so insistent on making Pine out to be the strongest-of strong 6ft guys. He doesn't look anything more than a solid 6ft tall guy, hovering around 184 at his best. He simply looks like a legit 6fter, something nobody seems to know when they see it these days because so many 5'10-5'11 guys inflate. Saw heck or high waters looked barely 6 foot in cowboy boots. Clearly not seeing the loft you are try lookibg above his eyeline. I may have been in error with 510.
but i would walk right up and bust his 6 foot claim any day. LOL, some height listings with the 1/4 in round up in several other sources while some height listings with the 1/2 in are rounded down in certain other sources. @ Sandy Cowell - That's good to hear! Yes, snout is a flippin' fantastic word! I could honestly see Chris Pine being the 6 foot that he claims, he could be 6 foot and a quarter though, so I don't know what to go for! That's afforded me a good first-thing-in-the-morning laugh, even though at 9 minutes to 9, it probably isn't first thing to the masses! I'm definitely going to use it more often! Also, isn't 'SNOUT' a flamin' fantastic word? @ Sandy Cowell - 🐽! Looks like he got the entire Bradley Cooper package - the nose job, chin, cheeks, jawline, etc. These perfect faces aren't natural - they're a result of extensive and expert plastic surgery. Chris Pine would've been a struggling character actor if he didn't get all that plastic surgery that turned him into a generic Chris hunk. He does look much more likable after plastic surgery, but good-looking people are just seen as more kind and likeable. In Wrinkle In Time, I thought he looked early to mid 40s, but he's only 37, and probably 36 when the movie was filmed. The gray in his beard makes him look older. He has the all-American good looks that just make people like him, undeservedly. Pine looks 2-3" taller than John Cho, who's supposed to be 5'10", so I'll buy the 6'. Seeing Chris Pine and Keira Knightley together in the same film really will be a treat, something not to be missed! As well as having confidence he has honesty too and it's great that he is not claiming 6'1" or 6'2", like many guys his height do! I think Chris is low 6 foot range, probably 6'0" - 6'0.25"! He definitely makes 6'0" though! @ Nik - Hi! Though I haven't yet paid enough attention to Chris, I have a copy of 'Jack Ryan...' upstairs (not its precise title, but I bought it because I find Keira Knightley such a delight to watch! Mind you, as Chris is in it, I can watch, and observe! My boyfriend once stuck the rehash of 'Star Trek' on, and as Chris is in it too, I noticed his tallness and confidence! Definitely clears the 6ft mark, and very likely 6ft0.5+ at his peak times! Have a great weekend, Nik and your family and friends too! My first comment today at 7:00 pm, here goes! I hope your autocorrect has not played up on this page! Chris Pine is clearly over 6'0" and it is great that he is honest about his height, he can have 6'0.25"! To be honest, I have to make a conscious effort to judge celeb heights. Without doing so I can be well of the mark. Maybe it's his face but without thought I might've given Pine 5'9" to 5'10". Crazy I know. Open my eyes a bit more to actually compare and yeah, the dude is definitely a good 6 feet. I remember his old man Robert Pine from the old series CHIPS. Anyway, another surprise to me was that Pine can actually sing - I mean he really can sing - so much so that Barbara Streisand invited him to sing a duet on her album. Sounds a bit like Sinatra. Not one of those actors who "think" they can sing. @ Rob - Well, I gathered the Interested Eleven round the table to break the news to them that these are jobs in high demand and furthermore, their success as applicants cannot be guarenteed. They immediately lost interest, pawing away at my phone so that I order them their own supply of Dreamies as they are growing tired of their Felix Multipacks treats. Added to that, Scotland is a long and arduous journey for them, and though people might be getting their cats to jump through hoops for them, surely they can't be THAT wonderful? @ Rob - Eleven of my fifteen cats would like to join your Cat Management System as they feel the earnings, at 10 Dreamies a comment, to be very competitive. Would you kindly forward some application forms. The remaining four are quite content with their Felix Treats! There is a queue round the block for the Cat Management Positions! As for Chris Pine, he's one of the few actors who isn't bothered about half inches as he looks to clear 6ft flat comfortably. Do you add these comments manually by HTML or do you have a content management system? When I approve a comment, the html page gets automatically generated again. To regenerate all 11,500 pages on the server, it's about 3 minutes. Gadot was pretty close to him in Wonder Woman, and I'm guessing her boots from her costume give her 3 inches. Pine looked to only have an inch on her with his boots, so yeah, 6'0 barefoot. So rob, if renner was taller and was looking under pines nostril that's 5 cm? It would be closer to 5cm yes, if his eyes were under his nose a little. If eyes were at chin or even a touch lower you are likely 5 inches smaller. Pine looked as tall or taller than Zachary Quinto and Karl Urban in his first Star Trek (haven't seen the others). Karl Urban looked a strong 6'1 next to Kevin Sorbo in an episode of Hercules (Urban was quite young then, playing Cupid, I believe). I would give Pine 6'0.75". Interestingly, he gave his height as 6 feet on SNL (but that may have been scripted). Usually 6'1 guys will say they are 6'2. It’s weird that Chris Pine said both he and Chris Evans are 6 feet tall, because Chris Pine is clearly taller than Chris Evans. Chris Pine must be pushing 6 ft. 1” and Chris Evans must be a weak 6 ft.
@Anonymous, Pine seems to wear those heels on occasion. He wore them to D23 in 2015 where he got pictured with Chris Evans-- which btw, dunno if that case was ever solved, but yeah that's why those photos and videos of him with Evans looked like he had 2 inches over the guy. He had those special Bradley Cooper-type lifts while Evans was pretty much in flats on that day. LOL @ that pic, Anon. Seriously, I thought he was tip-toeing in that picture at first... but with those boots he looks like he's 6'2+, edging out those tall women in heels nicely. 6'0.75 or 6'1 at minimum imo, I just think hes one of the very few who's either insecure about being tall or doesn't care about his height in the slightest. what the hell is he wearing there?? probably very similar to peak harrison ford! If Pine is only 6'0.5" that has to be his height before bed and def wakes up over 6'1. Rob, why'd you delete my comment 😭? It wasn't offensive at all. Editor Rob: I'm not even sure what it was, there's a few hundred comments a day to read, but if something goes too much off-topic it is likelier to be deleted. Some random comments can get deleted before I see them due to some spam filters, but it is rare and you'd have to use certain phrases to trigger it. If only pine claimed his height on Jimmy Kimmel. 6'0.75" is unquestionably an amazing listing for chris pine. Dreampuffe(5'9.5"), they have the potential to measure extremely close, not sure who'd be taller by the mm, but I agree they're 184 maybe 185 but definitely not 186. I'd love to see chris pine and chris Pratt stand back to back. 6'0 a joke to all of us. Pine look 6'1 with all co-star. At least 185cm next to 190cm Idris Elba and sometimes can look 186cm maybe Elba had less footwear. Rob, what would you say his head length is? Bending his knees again, i guess pine is like Reynolds, they're insecure about being tall, I was as well a few years ago and now I kinda want to be taller, it's weird how much a person can change. Editor Rob: in that photo, Quinto, Urban, Elba, Lin are all standing like that...but they don't seem to be exaggarting or forcing their opposite hip out much. Sometimes you can simply move one kneecap forward a bit and it makes little difference, other times you can bend it and push hip out to drop more height. Looks similar to urban, and they have really damn similar footwear. Perhaps urban has more mms of shoe. Same height as urban who barely edged pine. He's even hiding behind JJ ABRAMS for some reason, my assumption would be to look shorter. Stands further from the camera. He's bending his knees here. He seems to be insecure about being a tall guy. Pine is just a really tall man. Pine is in converse shoes that give 1 cm btw. I don't know how much shoe they wore though. Rob, what is more promising, 6'0.25 or 6'0.75? Pine isn't 6'1. For one thing he lists himself as 6 foot. This listing is fine. Not going to be much day light between a 6'0.5 guy and a 6'1 guy anyway that kind of difference is hard to see. @Slim Miles Teller does deserve an upgrade to 6'0.25". Oh and Christopher Lee is underlisted too. I'll have to see more of him, I hear he'd of measured in the 190's territory!!!!! Mark, miles teller is underlisted too, I think he's 183-184. Rob, do u agree he looks more 6'1" than 6'? 6'0.75", I think Chris excludes his three quarters just not to sound goofy, example when McConaughey says his "five eleven three quarters". I would say Ryan Reynolds, John Cena, Chris Pine, Henry Cavill, and (maybe Mark Gatiss). Reynolds is certainly peak Jackmans height or more, so yes. Haven't looked much into john cena, but a few visitors have seen the guy and probably think he's taller than robs listing. chris pine looks more a 6'0.75 guy I agree, Henry on the other hand is probably 6'0.75or6'1 as he wasn't much shorter than batfleck. I haven't seen any Sherlock to judge gatiss but he could be a strong 6'1 as seen next to rob. Pulls of 6'0.75". Will go with that. Pine is not 6'0.5" this low as he always look as tall as Zachary Quinto. They both 6'1 folks. Mark176.5, all the listings are guesstimates and a sometimes they're under or over the celebs actual measurements. I've found about 5 celebs who may be underlisted. Pine is really just damn close to 6'1". I have looked at some more pictures of him. He does appear to be a 6ft guy. Mark, under 6' is an impossibility for pine, there's a higher chance of this guy being a weak 6'1 then a weak 6' for sure. I'd be damned if Pine fell under 184 cm let alone 6'0" itself. If recommend comparing Pine to Cavill, Courtney and all the dceu cast, not the 3 Chris's from the mcu, cmon guys, let's be real for once. Also 6'0.75 shouldn't be ruled out of assumption. Chris Evans would need to get downgraded to 5'10" flat. Chris Hemsworth would need to get downgraded to 6'0 3/4"-6'1" (putting Liam Hemsworth at 186 CM). Tom Hiddleston would need to get downgraded down to 5'11 1/2"-6'0". Chris Pratt would need to get downgraded down to 5'11 3/4". This would involve every single celebrity needing to obtain a significant downgrade, leading to people trying to downgrade them even further after that until they're all listed as being 5'4" or lower. Seriously though, he would never measure below 184 CM, unless he were hunched over during the measurement. We'd have to downgrade Current Kevin Costner to that Mark and poor Denzel Washington to 5'10"! No way he is that tall. 5'11 max. A strong 6' or 6'0.5 184 cm either way. 6' plus is a very fair say. Why does everyone guess this guy taller. He is definetly not 6'1. I believe he's maybe a quarter inch over 6 foot at the best. But this listing is accurate enough. He doesnt need an upgrade. @christian he might not want to sound insecure by saying 6'0.75, wanting to be 6'1 meaning he'd just go with 6'0 as a means to accepting that he's 6'0 range. Or he could just be a modest guy. Don't forget he's not a height guru like you or many of the people on this page. I'm 5'9.25 at night and 5'9.75-10 in the morning but I just claim 5'9 because if you say anything with a half or quarter it makes you seem like you're bothered about your height and want to have as much height as possible. No real 6'0.75" guy would claim 6'0" unless he's insecure or hates his height. Pine's a legit 6'0" like he claimed, possibly 6'0.25" and just rounded down. Only way he is 6 feet flat is that he wears lifts all the time. Which I doubt. He looks a solid 184cm guy. He keeps saying that he is 6 feet tall but never really accounts the half inch in the listing. He claimed in his SNL monologue he's 6 feet tall and so is Chris Evans. Click Here at 2:42. So would it be possible to downgrade Chris Pine to 6 feet flat since he feels like he's being genuinely honest about his height as this could be the height measured in the afternoon? Editor Rob: he still seems a guy who is dropping a fraction from his measured height. Duchovny was similar - always said 6ft exactly, then years later 'a little over six foot'. 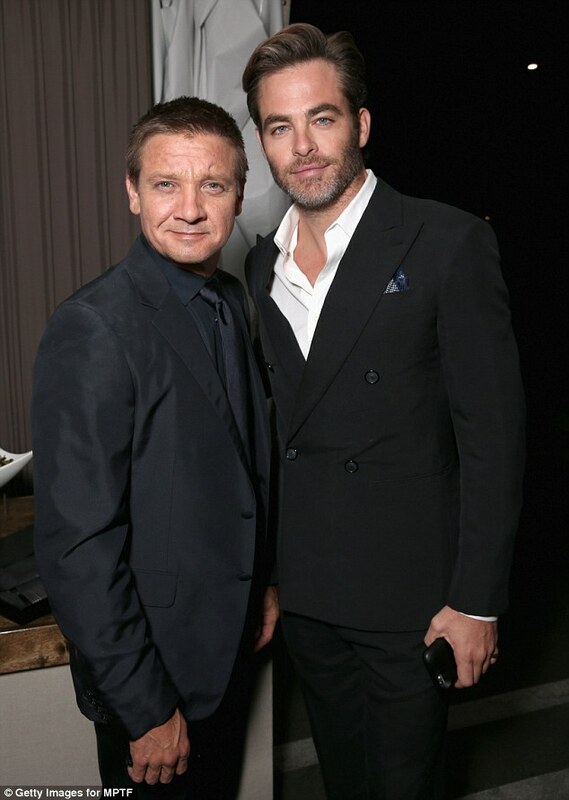 He looks a guy who is like 3.5 inches taller than Renner, with possibly a bit looser posture. Would give him 6'0", but no more. And 5'11" would be far from shocking. Gadot wears 3.25-inch boots in Wonder Woman costume. He looked a bit shorter in wonder woman than this. I think this .25" can be shaved off this listing. He said 6'0 because that's what he measures during the day. Up until afternoon, out of bed, he is probably around ~ 6'0.5''. I was measured at 6'0 3 h after waking up to the stand at 5'11.5'' at 8 pm. Somewhere between 6'0" and 6'0.5" IMHO. Looks how a legit solid 6'0" should look like. So refreshing to see a guy claim a modest six foot when he's clearly over that mark, in a stark contrast to the likes of Afrojack who doesn't seem content with being "only" 6'7.5. I think he is a solid 6'0.75"
Gadot, who's at least 5'9 is always wearing 3 inch heels when promoting Wonder Woman with Pine, yet he still edges her quite clearly. Pine could definitely claim 6'1". Listings are spot on, Rampage. Pine can look a full 6ft 1 at times. 184 is definitely his minimum. Rob, how likely are those estimates? Editor Rob: I think many would say that those guys may well measure close to those figures. He said, "I'm 6 feet tall" on SNL. He looked around an inch taller than 6' Leslie Jones on SNL, which is odd. Just saw snl skit with bobby Moynihan. Bobby listed at 5'8 but more likely 5'6.5"-5'7". Pine actually looked only about 4 inches taller and they were in the exact same footwear. If he said 6 foot(183 cm), we must believe his height. Do you know what would be funnier? Legit 6 feet can look 6'2". Pine is an example of that. It's possible he's a 6'0"-6'0.25" guy who wears a 0.5" lift in his shoe. A half inch lift is virtually unnoticeable. Just doesn't make any sense at all for a legit 6'0.75"/185cm guy to claim six-foot. I think 6'0.75 is better. Doesn't really seem much shorter than Eric Bana, at times the difference can seem minimal like half inch. Pine had a solid inch on Cumberbatch. Weird thought he was shorter than Cumberbatch. 6'0.75" is his real height. Looked a good 4 inches taller than 5'8 James Corden on his show, looks to be about right, could even be 0.5 inch above his claim of six flat. Rob can you add Hell or High Water? I'd argue that should be quite high on the list now. Pine looks taller than Urban Imo, you could argue it's just postural differences etc but I think 7 times out of ten Pine edges Urban. 6'0.75 is certainly plausible. I think 6'0.75" would be better. Similar to Cavill, Cena, and Michael jai White. Six foot flat is impossible. Rob are you gonna stay with this listing for Chris Pine, Karl Urban and Zachary Quinto? Editor Rob: I think they each would measure very close to their listings. Taller than Denzel Washington and looks the same with Karl Urban. 6'0.75" is more like it! How many inches do you think Gal's shoes would give her in wonder woman costume? I see a solid 1.84. I'm really curious to see if he and Gal may be in even footwear in Winder Woman next year.. I saw Chris Pine one night in Hollywood. He is 6-1 heading to 6-2.
i think its weird that people think chaning is a couple mm taller than this guy.this guy besides other looks from 184,5 to 186 beside other people (when perfect posture so 184,5 is probably what he is) at best 185. and channing look 182-185 besides people whit usually bad posture. and 10 years back when he was skinny he could look 186. Rob do you have more respect for this guy because he's so honest about his height? Happy holidays btw! Editor Rob: CS, I have respect for good honesty with height. It's always tricky if you are right between 2 marks and don't want to give a half inch...do you round up/down? If we used the Metric system universally, then there is less rounding. At worst you might sit on 170.5cm and so if you round up or down, it only means half a cm....far less than a half inch. This guy makes me proud for being this height. One of the most, if not the most honest 6 foot claiming guy I've ever seen. He looks every bit of 6ft0.5, at worst he may be 6ft0.25, but not anything under that. Plenty of self-proclaimed "6 footers" are actually only 5ft10 or 5ft11. And most men that are the same height as Chris Pine claim 6ft2. Zachary Quinto was at least 1inch taller than this guy. I think he is what he claims to be, 6 foot flat. Not really, it's just that 6'0.75" would suit better like Cavill and Cooper. 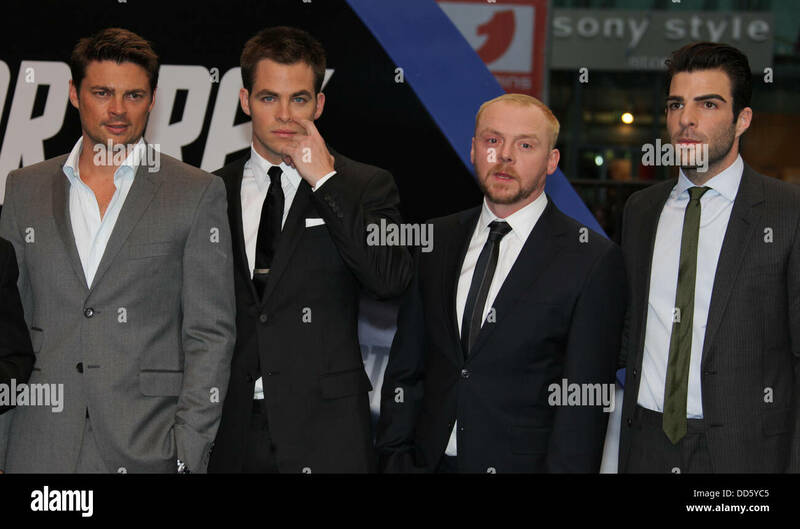 In all seriousness, Pine and Cavill do deserve an upgrade to 6'0.75"
Editor Rob: it's funny seeing Pine standing beside Simon Pegg and thinking one is 6ft and the other 5ft 10. I would never list them at 5ft 10 and 6ft, there's a lot more than 2 inches between those guys...although Pegg already quite mad about his height. My memory says boots as Denzel is under 6 ft both in boots pine is under 5 11. As this takes place on uneven gravel guess its not the best proof. FYI Chris H looks 6 3 + in flip flops so divide that by one 5 11 guy and you get big lifts. I've seen him in several movies always though he looked low side of average. He has the head and torso of a small man doubt he has that long of legs. I bet yes cash money he is 5 10 or less and wears lifts. This is possibly a perspective thing but I dont buy it. He always wears at least work boots 1 in more than regular shoes or other heeled foot wear. He is an easy inch shorter than Denzel who is bald in unstoppable.. while wearing boots. Dont forget the legendary scandal of Star Trek leading men they always wear lifts. Barefoot he is 5.10 3/4 on a good day. @S.J.H it will be hard to fight 6'0.75" because he was edged out by Kevin Costner. He looks 6'1 with Idris Elba. Rob, where would you put this guy? Editor Rob: still go with D for him. In Pine's new film, Hell or High Water, there's a shot of his character's (Texas) driving license, which lists him at 6'0". He looks full 6'1" next to urban and quinto in the new Star Trek film. Rob, do you think it's possible instead of Pine at 184 and Urban at 185, it could be the other way round ? They look painstakingly close, but If I had to call one taller I think I'd maybe say Pine. Rob, could be a weak 6'0.75? Editor Rob: at times he can pull off looking near to 185cm with people, but I think 184 range is still a good enough shout for him. There's a video of him next to Chris Evans and he's a good 2 inches taller? Surely a legit 6'1" or a downgrade for Evans and severe downgrade for Antony mackie aswell rob. 5'11" going by Johno's rules. Rob, how come Chris credits himself as 6'? He was above Chris Evan's eye level when they spoke to each other at D23. Editor Rob: maybe he just rounded down, I think most people agree he can look over a flat 6ft, but if you are 6ft 1/2 inch range maybe at times you just say six feet rather than six one? it all depends on average. I would say you need to be 10cm above average to be considered tall. Now 7cm can be start of tall. Has to be one of the most honest celebs out there and would put to shame most 6-foot claimers. Here in Norway, I don't think we consider 184(little more than six feet) as tall at all. My brother is 183, and has never considered himself tall nor by others. I think "tallish" starts at 186(6'1), 1cm more than my father at his peak(185). Me myself is 188(6'2) and do not feel tall, although I'm often considered that and classify that as tall because after all I'm taller than most(average Norwegian height is 180-181). In my opinion, you have to be at least 190 before everybody notice you are tall in Norway, which my oldest brother is. Tall starts at 187 to me. I know it's relative though, and with an average height of 176 in the US, six feet is recognised as tall by many. @jake..yh but Chris might well be more 6'1 than 6ft anyway. Just goes to show that six-foot is still tall!. Chris Pine is a tall man no doubt about it, he's not "above average" or "tallish" he's TALL full stop. But no cigar, sorry rob I'd have to say 6ft 1/2. Rob, how about 6'0.75 for pine? I am currently working on Wonder Woman. Really surprised at how big Chris is. I have stood next to him on a flat surface, he's at least 6'2 and well built, his head and hands are huge. Next to 5'5" emma Watson he looks like he's around 6'2"
Rob, can you upgrade him to 6'1 instead of 6'0.5? Sometimes suspicious footwear but at least 6 feet. 74kg@184cm -that's one seriously lanky dude. No wonder many people would give him full 6'1- thinner always looks taller. Tatum was considered 6'1 until he gained some serious mass-nowadays people even doubt if he's 6ft tall! Looked 6'0.75" minimum IMO in premiere photos from Star Trek with his co-stars. Yeah, almost every other actor of his height claim 6'1" rather than rounding down. The Strongest 6 foot height alive. Tall guy defo looks 6'0.5 I think he would just edge me out In person. Tall guy, good looking and great actor! 6'0.5" seems fine to me! For sure nothing under 6'0.25" for him! Rob, do you think he gets up towards 6'1.25" in the early morning, like some of the other guys listed at this height? It would seem very odd for him to be measuring that high and yet always claiming to be a flat six feet. if he's 6 foot, then Jason Bateman is 5'10. I think CP is a legit 6'1. "Chris Pine's height is 6ft 0¾in (185cm)"
He looked around 6'1" in Star Trek. Also, in Unstoppable, he was a smidge taller than Denzel, who I believe is a legit 6 footer. Rob, are you sure Pine is 184? He looks shorter than or at most the same height as Patrick Wilson, who you listed as 181, in STRETCH.